Sara discusses how the experiences we have in our daily lives are lessons for us to learn. She talks about how these lessons mold us into who we are and who we will become. As we learn and grow from them, we can lead by example and teach others. The growth is in the lessons. Sara discusses the phrase: “Things don’t happen to us, they happen for us.” We are not being punished. The universe/God gives us lessons to help us grow. We have the choice to learn the lesson or not. We will grow and ... See More become better people if we choose to learn the lesson. We will not grow if we choose not to. We have free will and we have the ability to look at things in a positive way or a negative way. It’s about mindset and perspective. 8:06- Sara gives some examples and share stories of how to view situations as lessons. 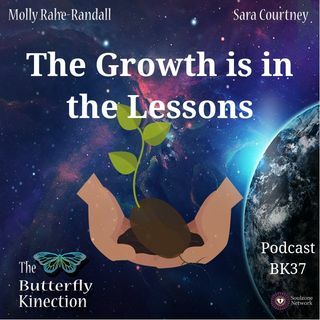 Sara goes in depth about how life experiences mold us and shape who we are as people. What we’ve seen, gone through, and felt make us better and stronger. 14:41- Sara talks about abundance and how to change our perception of what that really is. She shares a personal story of learning abundance by losing her rental property. We are also better teachers when we are learning at the same time. If we are better learners and we use our experiences to teach us something, then we can lead by example by going out and showing everyone around us how we react to situations. As we emit positive thoughts, every action of kindness we take, every loving word we say will inspire others. In that moment we teach others that they are capable of doing the same. The lessons we learn are for our highest good. By learning the lessons in life, we embody the soul growth of what our soul is yearning for. If we live with compassion, love and kindness and understand that the universe has our back, we have the ability to come out of anything and be stronger for it.